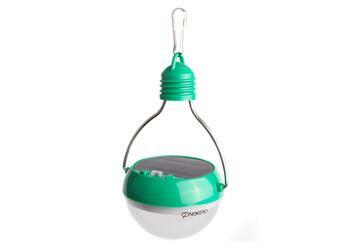 Easy to hang Nokero Solar bulbs charge by day and bring hours of light each night. Nokero (short for No Kerosene) was formed in June 2010 to develop safe, affordable and environmentally friendly technology that eliminates the need for harmful and polluting fuels used around the world. The easy to hang Nokero Solar bulbs charge by day and bring hours of light each night. They're bright enough to replace most traditional electric lights. The Solar Globes are water resistant, and replaceable batteries will last for approximately 1.5 years, depending on use. The Nokero N200 is the most economical solar light on the market, and is ideal for solar indoor and outdoor lighting, including cooking, reading, camping and emergency lighting.